Grace and Truth Christian publishing company began in 1993 for the purpose of bringing out of print Christian children's books back into publication. It was founded by Dennis Gundersen, a Senior Pastor in the Tulsa Oklahoma area. As a result of serving in ministry, Pastor Gundersen wrote Your Child's Profession of Faith as a guide for Christian parents who desire to help point their children to Christ at a young age, but without pushing them to make a decision before they are ready to. As I read Your Child's Profession of Faith, I found Pastor Gundersen's advice to be wise as he admonishes parents not to make a profession of faith for their child by rushing them to make a decision to follow Christ. He certainly believes that young children can come to Christ, but the very nature of a child warrants us to take somewhat of a wait and see approach. However, during that waiting, we still want to continue to point our children to the truth of God's Word. Pastor Gundersen states "...that ultimately, the years your children are at home...[is] a season in which you are crying out to God with deep longings as you await the outcome of your prayers with many hopes and yes, many fears as well. Your abundant prayers are that they will choose the path of Life. That they will bow the knee to Christ and live for His glory. For you know that it depends upon a work more powerful than anything you can do. You know that, even after your best and most faithful discipline and instruction have been poured in, only when they have matured in years, will you see for sure which path they have chose to take." Gundersen thoroughly discusses the issue of whether or not young children should be baptized. He feels it is prudent to be sure, as best as one is able to be, that the child truly understands what it means to follow Christ and forsake the world rather than rushing them into baptism. I found the chapter on counseling one's children to be the most beneficial. For example, those of us who have children that have made a profession of faith aren't suddenly exempt from sinful behavior. This can make it difficult to discern whether or not they've truly come to Christ, but even as adults we all struggle with persistent sin. Gundersen reminds us that "when examining a child's 'fruit', [to] remember that conversion will not gut him of his personality, strengths and weaknesses...Conversion, however, will sanctify those traits." At the end of the book Pastor Gundersen gives some very helpful questions that a pastor can ask a child when considering if he is ready for baptism. I think these questions are also excellent for a parent to use with a child to help get an idea of where they are at in their walk with Christ. In addition to Your Child's Profession of Faith I can tell you there a lot of other books from Grace and Truth that I would like to read. These book are all at a discount, too! 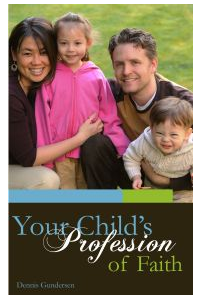 Your Child's Profession of Faith is available for only $7.50 from Grace and Truth Books. The ebook version is also available for $5.50. This book is an excellent tool for any Christian parent. It is especailly helpful in making the parent mindful of how they are handling their child's profession of faith and/or their desire to be baptized.